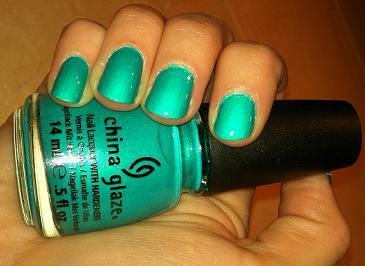 China Glaze Turned Up Turquoise (Neon) #70345 is a vibrant turquoise polish. It is very summery and looks like the waters in Turks and Caicos. I applied a base coat and then two light coats of the China Glaze Turned Up Turquoise. The polish dries with a matte finish so make sure to finish it off with a good top coat to give it a glossy finish. I love China Glaze nail polishes and think they are one of the best out there. They have a wide variety of colours and I think that they are very affordable. I always buy them when they are on sale at Sally Beauty Supply. Beautiful! I wonder if this color is still available? It is still on Amazon but I am not sure if Sally Beauty still has it.